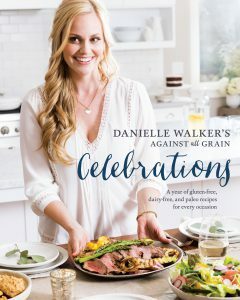 New York Times bestselling author Danielle Walker has a lot to celebrate in her new cookbook Celebrations, a collection of tasty holiday recipes she’s reformulated for those who live the Paleo lifestyle. Walker’s story is an empowering example of taking control of your body and health through nutrition. In her early twenties, she suffered an incredible battle with ulcerative colitis, an autoimmune disease causing abdominal pain and deficient nutrient absorption, which inspired her popular blog Against All Grain and three subsequent cookbooks. Each compilation outlines the dietary changes and recipe conversions that put her disease into remission. While Walker won’t dictate “rules” to her readers, she encourages them to identify their own trigger foods and balance those with the realities of their lives. I recently had a chance to chat with Walker about the steps that brought her to where she is today. DH: There are more than 200,000 new cases of ulcerative colitis (UC) diagnosed each year. Are there any long-term consequences to the condition? DW: If symptoms are ignored, UC can lead to colon cancer and even death. You have to be proactive about taking care of yourself and cannot allow your body to stay in a flare [inflamed state] for an extended period of time. It can also cause prolonged anemia and malabsorption which can result in a host of other side effects. DH: Changing one’s diet can be hard for families. What has been your experience? DW: When I first changed my diet, I was having a hard time sticking with it because others in my family were still eating things that I loved that I knew I couldn’t eat. It wasn’t long before my incredible husband decided to eat the same way I did in support of my health. He would occasionally have a burger or pasta when he was at work and would later complain that he was so tired, and how his stomach was bothering him. That’s when he realized he had a gluten intolerance. Since then, he has been 100% gluten-free and Paleo 90% of the time. DH: More and more people are experiencing that. Do you think that certain intolerances could be the result of genetically modifying food? DW: Absolutely. The way that certain foods are produced and modified in America is so different from other countries. I’ve heard stories of folks with celiac being able to tolerate pastas and breads on trips to Europe because the wheat is so different there. I also think a lot of it has to do with what we are spraying on our crops here in America. DH: Your cookbooks encourage people to cook with real ingredients. Do you find that the proliferation of gluten-free and Paleo foods on store shelves helps or hinders good health? DW: I think it’s amazing that so many stores and restaurants are becoming more aware of food sensitivities and allergies. That being said, there are many products being marketed as gluten-free which give people the misconception that it’s healthy for you. I think that people need to realize that processed gluten-free foods should be consumed in moderation, just as you would with any snack. I love that I can find Paleo treats or snacks for my family on the market shelf, but I still make sure to check the ingredients because I find some still include additives or gums. My advice: always check the label, and make it homemade if possible. DH: The secret to a Paleo or gluten-free lifestyle is being aware of substitute foods. Is there any one recipe conversion that stumps you? DW: Many people ask for a substitute for coconut flour in recipes either because they are allergic or simply don’t like the taste. Unfortunately, that is one of the hardest things to substitute as coconut flour is extremely absorbent and really unlike anything on the market. Some say you can substitute in other grain-free flours like almond flour or arrowroot starch, but I find it really does not mimic the same texture that coconut flour can provide. DH: What is the number one thing you would encourage doctors to ask patients in similar situations to yours? DW: I would love to see doctors begin to recognize the anecdotal evidence of so many patients finding health from a Paleo style diet and recommend that their patients give it a fair try prior to recommending some of the harsh medications. Diet may not be able to cure all, but it certainly can help prevent and manage many ailments people are popping pills for. Celebrations is an all-encompassing guide to entertaining for holiday celebrations, large and small. Not only does Walker provide healthy alternatives to traditional trimmings, such as her apple pie and maple pumpkin pie recipes, but she also adds new twists with recipes like the vegetable bacon parcels that accompany her stuffing-filled turkey breast. In Celebrations, Walker presents the tools and encouragement to all of us who find it hard to stick with necessary, but strict, nutritional guidelines…a particularly daunting task at the holiday table. Contributing writer Pam Salvadore of La Quinta is a nutrition journalist. For more from Pam visit her blog pamsalvadore.wordpress.com. < Previous Time To Diet: The ups and downs of finding the right fit.